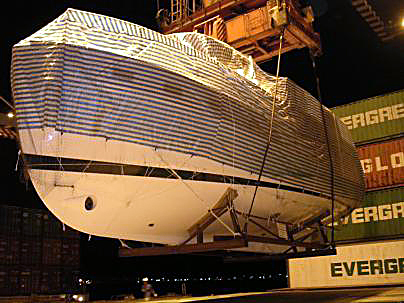 October 9th 2005: We just received a call from Greg Gandy at Krogen that our boat was offloaded from the container ship in Baltimore Maryland. She is now on her way to Zimmermans Marine in Virginia for the initial commissioning. October 15th 2005: After spending two days at the Annapolis Boat Show, we are finally on our way to Zimmermans Marine to see Idyll Time for the first time. Greg Gandy with Krogen meets with us to go over the commissioning process. We spend the day with him going over the details for Idyll Time. We are so excited to finally be on board our boat even if it is for just a few hours. We will next see her in Stuart Florida where she will stay until May of 2006. At that time we will bring her home to Chattanooga TN. on the TN River. Our next visit will be at Christmas when we will outfit her with the many items we have been acquiring over the last year in anticipation of her arrival. 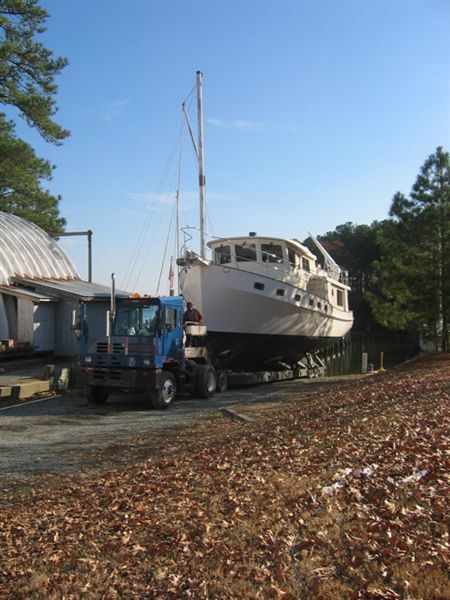 December 7th 2005: We just received an email that Idyll Time is back in the water. Zimmermans has installed the get home system, dinghy and davit, and various other items. The sea trial will be on Saturday and she will depart for Stuart at 6:00 A.M. on Sunday morning. Captain Bob Ludlow will be bringing her to Stuart. We will meet her there in about 10 days. December 18h 2005: Idyll Time arrived in St. Augustine at 5:30 this evening. She spent the night at her dock, B-20 at the Conch House Marina. We bought this slip earlier this year in anticipation of Idyll Time. Jeff’s parents live two blocks away. We took Captain Bob Ludlow and his mate Sam out to dinner at Schooners. December 19th 2005: We saw Idyll Time off this morning. She is on her way to Titusville tonight. She should arrive in Stuart Tuesday evening or Wednesday morning. We are leaving for Stuart this afternoon with the U-Hall and all of our stuff. December 20th 2005: Idyll Time arrived at 8:30 P.M. at the Krogen docks in Stuart. Captain Bob was tired. She is docked next to Tapestry. 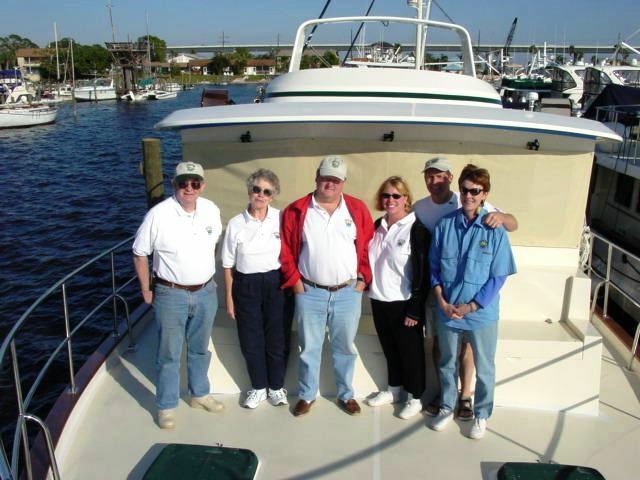 December 21st 2005: We arrived at the docks at 6:30 A.M. Captain Bob came to pick up his belongings. Bruce Goins of Bristol Tech arrived this morning to start on the electronics. He went with us yesterday to pick up the stereo system and TV. for the master stateroom. By afternoon he had the displays installed in the pilot house. We made several trips to the storage shed bringing things on board. December 23rd 2005: We have accomplished quite a bit in the last couple of days. We met with the carpenters, Krogen folks, and the person doing the name boards. There should be quite a bit of work done in the next several weeks getting IT ready for the Stuart Boat show and Trawler fest. Krogen will be using her in both of these shows. We went to dinner on night with Bill Harris and his wife Tracy. They gave us a beautiful ships bell clock for the boat. Land Ho’s owner Don Orbitz went to dinner with us also. We enjoyed talking with him. The next night Tom Button and his wife Karen took us to dinner in downtown Stuart. We enjoyed our time with them also. The krogen folks have made us feel very welcome and we are looking forward to being part of the Krogen family. We will be back in several weeks and see what progress has been made. January 7th 2006: Today we met Jeff’s parents, his sister, Sue, and her husband Jimmy at the Ramada Inn in Stuart. We are spending the weekend visiting Idyll Time. Tapestry. Don Orbitz is also on Land Ho. Tom and his wife Karen came by this afternoon. Jeff’s parents had brought Champaign for a christening of Idyll Time. Bill and Stacy, Charlie Ann and Jim, Tom and Karen, and Jeff’s sister Sue and her husband Jimmy also were there for the christening. We had a nice time on the bow of the boat visiting with all the krogen folks. We had dinner this evening at the Dolphin Bar and Shrimp House. 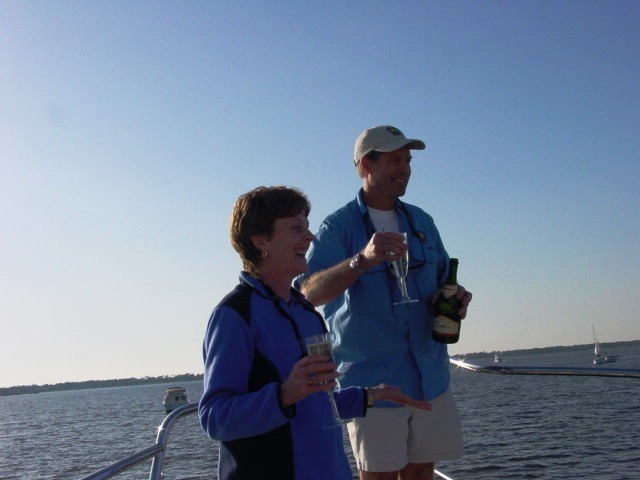 January 8th 2006: We spent several hours on Idyll Time before our flight out of West Palm. We watched Krogen move several boats for the Stuart Boat Show. We also had a tour of Blue Heaven. She is a very nice boat. We enjoyed spending time with Charlie Ann and Jim. We were also able to put our refrigerator together today. Krogen will have to put the rugs down and finish cleaning the interior after the works is done next week. Our next trip down will not be until Feb. after all the boat shows. The boat should be finished by then. February 3rd 2006: We fly to West Palm late Friday. Arrive on IT at 12:00 A.M. Jeff is up early and makes a trip to the storage shed on Saturday. Captain Bob arrives at 8:00 A.M for a boat docking lesson. Jeff has no problems docking. We do about 4 or 5 practice approaches. The first mate is not as good handling the lines. There is a lot to keep up with! February 18th 2006: We catch a flight from Atlanta to Miami to visit Idyll Time in the Miami Boat Show. We are very excited to see her in the Show. She looks great. February 24th 2006: Another late night flight to West Palm. Jeff is up early and makes a trip to the storage shed on Saturday. Captain Bob arrives at 8:00 A.M. for a boat docking lesson. The weather is still not good so Captain Bob decides to come back on Sunday. Another trip to the storage shed and we now have everything on board. We have a busy day unpacking everything. Sunday’s lesson goes very well. Jeff practices docking several times with no problems. The first mate is not as good handling the lines. There is a lot to keep up with. March 17th 2006: Today we are leaving for West Palm to visit IT. We miss our flight from Atlanta and have to fly into Ft. Lauderdale. We arrive on IT at 3:00 A.M. We are tired. Up early the next morning to get ready for Captain Bob. We take IT our and the bow thruster is not working properly. We put the dingy Time Out in the water for the first time. It runs great. The generator keeps shutting off. We are not sure what is going on. Jeff docks the boat without the bow thruster. After shutting off the boat we check the engine room. We take the panel off the generator and their is a huge oil leak! We give a call to Gregg at Krogen and he comes over the next morning to check it out. They will have to investigate further next week. This is why we are putting so many hours on her before we bring her across the gulf. We have dinner at Courtines just down the street. It is one of the best restaurants we have been to in Stuart. April 7th – 9th 2006: We catch another late night flight to West Palm. We make our flight from Atlanta with 5 minutes to spare. Our luggage was not so lucky. Our pilot house carpet has been installed by Saturdays along with the window porthole covers. Everything looks great. Saturday we are up early for another training session with Captain Bob. Jeff does several practice dockings. I get my first practice session with three side dockings both into and with the wind. No damage to the boat. We take the boat up river and have our second practice session launching Time Out. Overall things went smoothly. We then took the boat thru the Roosevelt Bridge for another new experience with no complications. We spend the afternoon trying to fill our DAN oxygen bottle with no luck. We have dinner at a new restaurant, Shells. On Sunday we make another trip to the grocery store for provisioning our trip home. Then back to West Palm to catch another late night flight. We only have one more trip down before bringing IT home. This entry was posted on December 14, 2006 at 6:02 am. You can follow any responses to this entry through the RSS 2.0 feed. You can leave a response, or trackback from your own site.